Wellington contains a wealth of restaurants, cafés, eateries and dining options, both in and around the Central Business District (CBD). With many new eateries opening all the time in Wellington and nearby areas on the south coast of New Zealand's North Island, restaurants and cafés in the city could certainly be described as being quite diverse. Wellington is often referred to as New Zealand's coffee capital and is full of stylish, trendy coffee shops, which are accompanied by a thriving street café culture. Dining venues in Wellington range from bar snacks to fast-food outlets, café lunches to gourmet dinners in top restaurants situated in the city centre. 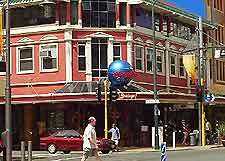 Courtenay Place is home to the largest concentration of eateries in the city, together with nearby Cuba Street. These areas feature an enormous variety variety, including ethic, Turkish, Asian and French dining establishments, with many lively nightspots located nearby. Courtenay Place is home to 'Restaurant Row', with some of the most popular options standing side by side. 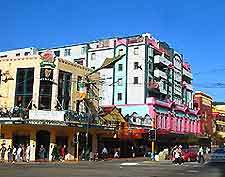 Many of Wellington's inner-city suburbs feature some extremely popular restaurants, such as Allen Street, Blair Street, Cuba Street and Dixon Street. Other important dining options are located around Cable Street, Majoribanks Street, Pirie Street, Taranaki Street, Tory Street, Victoria Street, Vivian Street and Willis Street. All kinds of cuisine can be found at the city's vast array of busy restaurants, which include many exceptional ethnic Malaysian and Indian options around the city centre. 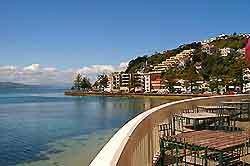 Wellington has long been one of New Zealand's most cosmopolitan cities and eating out is always popular with visitors. One of the most popular choices is the Skyline on Upland Road, which is situated at the top of a tall skyscraper and provides spectacular views of the cityscape. The majority of restaurants in Wellington are always happy to accept dining reservations for both lunch and dinner and it is often a sensible idea to call in advance, so that your place is guaranteed at your chosen establishment. Most Wellington restaurants, cafés, eateries and general dining venues usually open all week, between 07:00 to 22:00 and often stay open until much later, although some do close on either Sunday or Monday evenings. Lunch ranges from sumptuous buffet meals at fashionable waterfront restaurants around the harbour areas, to simple, fresh sandwiches readily available from one of the many popular sandwich bars or food stalls in the city centre, which often sell a huge range of freshly-prepared bagels and paninis. Also, the many food courts in Wellington's numerous shopping centres and malls are filled with cheap eats, providing an inexpensive lunch alternative. Lunch in Wellington is generally eaten between the hours of 12:00 and 14:00, with dining options including a host of fast-food restaurants and outlets, local burger bars, fish and chips, pizza takeaways and a number of tasty vegetarian choices. 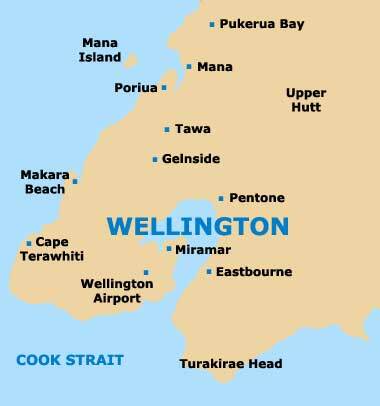 Many locals, visitors and tourists in Wellington, and other nearby areas of New Zealand's North Island, regularly dine out in the evening, with venues serving dinner from 18:00 to 22:00 and often later. There are an enormous selection of world-class restaurants, brasseries, cafés, bistros and popular eateries in the city of Wellington, and with so many different types of cuisine of offer, choosing where to dine is not always easy.